Fall is definitely one of my favorite seasons. Not only does the weather cool down, but the new fall beauty and nail collections, are something I always look forward to. Although I had a lot of fun sporting bright nail colors this summer, I can't help but miss those deeper splashes of color, that are on my nails all fall and winter long. 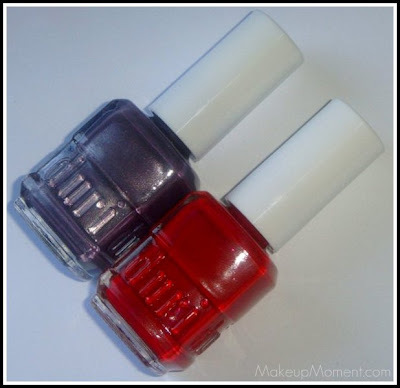 Today, I have two lovely Duri nail colors to show you all, and they are both perfect fall shades. 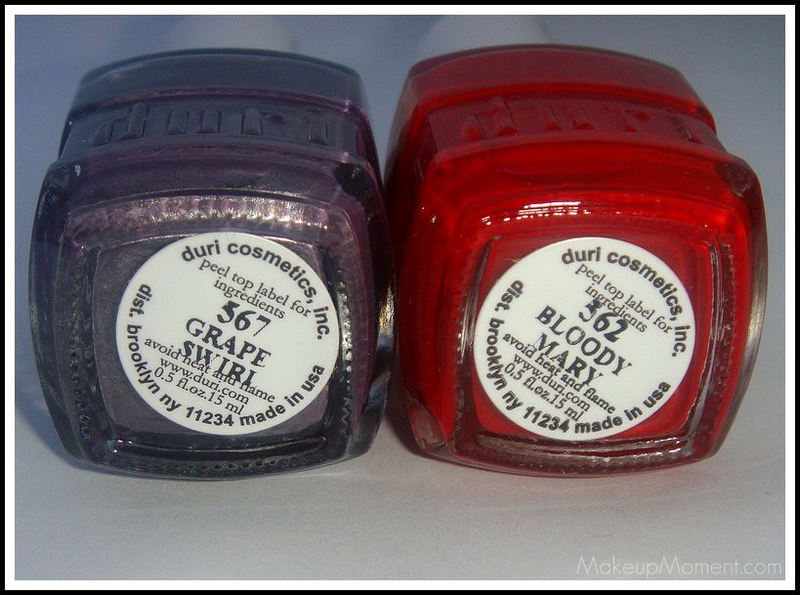 Grape Swirl and Bloody Mary ($5.00 each), are just two of the six new colors from Duri's new Fall 2011 Wine Tasting Party Nail Collection, due out this September. This color is the one that stole the show for me. I have nothing like it. I would describe Grape Swirl as a purple with a hint of gray added in. 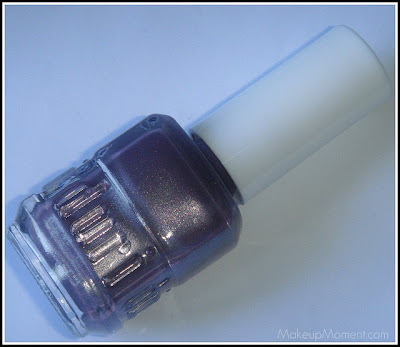 The really cool part is that this color contains lovely, fine golden shimmers that give it a sort of metallic finish. The formula was perfect-not too thick, or runny. The color applied smoothly and evenly. I got complete opaque coverage with just one coat. But I like to always seal the deal with two. I already know that Grape Swirl is going to be in constant rotation this fall. Bloody Mary is a gorgeous medium red cream. I want to mention that my camera just did not want to cooperate with me, while I was taking the swatch pictures for this color. 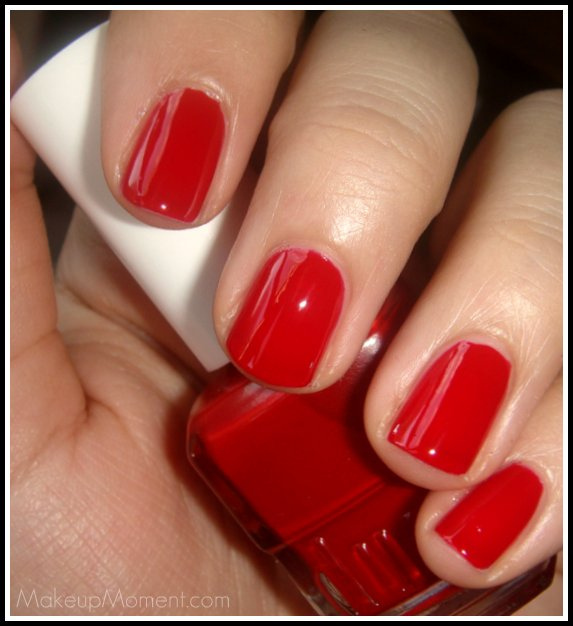 The picture above shows this color as being more of a cherry/tomato red. But, this color is a bit more darker in person, more like an apple red. Lovely color nonetheless, that I am sure is a staple color in everybody's nail collection. This color applied beautifully, and I got even and opaque coverage, with 2 coats. I have grown to really love Duri nail colors. I am always content with the fast drying time, and lasting power. Not to mention the lovely shine finish. It's like a topcoat is optional with these. Love! Be on the lookout for this collection, and check out other Duri nail colors over at www.Duri.com. What do you all think of these colors from Duri? What are your favorite fall nail colors? Disclaimer: I received these products from PR for review purposes only. I am not being compensated for this review. As always, my reviews are 100% honest. Isn't it? 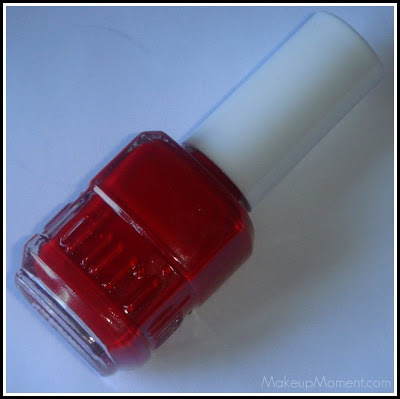 Have you tried Duri polishes before?